"He gives us problems to drive us to Him so that HE might solve them and show us who He is." The Mystery of Discipleship is a 91-day devotional that brings fresh revelation of the Spirit each time you read it, whether you’ve walked with the Lord for 30 years or three. 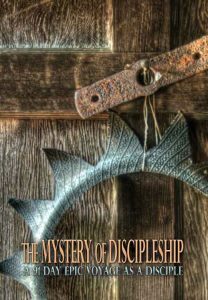 Begin a 91 Day Epic Voyage as a Disciple with The Mystery of Discipleship! In this hour, the fresh wind of the Holy Spirit is blowing on the ancient subject of discipleship! Through discipleship Jesus comes to capture you and take you to an intimate fellowship with Himself, no different than the first disciples. A disciple experiences the Living Christ. Now available in both print and digital. DAY 13: What Is God’s View of Disciples? Jesus challenged the values of His host. The Pharisee’s choice of guests was typically human but not divinely inspired. God’s preference is the sick (Mt. 9:12), the wounded (Lk. 10:25-37), and the poor (Mt. 5:3). To understand discipleship, there must be a change from human nature that welcomes the successful, the rich and the family, which is really a selfish investment for an immediate return. To comprehend the issue of discipleship before God, Jesus had to effect a transformation of thinking. It is only the needy, the unable, the poor, and the ignorant that can become a disciple. The proud, the strong, the independent, and the ‘knowing’ will not qualify. Father, please let me see with YOUR eyes what my earthly eyes miss. I choose to love who You love, where You love, and how You love! Through Jesus. The parable of the “Great Feast” is a preparation for Jesus’ most extensive discourse about discipleship. The story holds the secrets of God’s view of disciples. We are all born with Adamic independence, and the world system encourages human strength. So the strong will not need the Lord. The self-sufficient never would bow to enter. The ambitious will not care to attend. The worldly will not follow Christ. And the religious will not want to attend! Only the needy, the weak and the poor sought out the Lord when He walked here. He never knocked on doors. He never invaded and truly, He never begged anyone to follow Him. Jesus offered. He invited. But the response is yours…and mine. Father, please show me my self-sufficiency and independence of You, that I might fully and joyfully accept Your invitation. In Jesus. And there was a woman in the city who was a sinner…she brought an alabaster vial of perfume, and standing behind Him (Christ) at His feet, weeping, she began to wet His feet with her tears, and kept wiping them with the hair of her head, and kissing His feet and anointing them with the perfume. We don’t know who this woman was. The Holy Spirit deliberately omits her name. But she stands for all those who love the Lord with undying love. This unknown woman had a love for Christ that gave Him her time, her goods, and her heart with abandon. Caring nothing for the approval of man, the inappropriateness of her action, she went past this company of arrogant men whose superiority to her had no longer any power to bring her shame. She had no need for human approval, understanding, or respect. Her need? Her goal? To lavish Jesus with the love she had for Him, a love that produced such humility and vulnerability that she cared only to express it to Him. She was indifferent to the scorn of the religious and the misunderstanding of the watchers. Her great love was the only care of her soul, the single focus of her heart and all else was irrelevant and immaterial. This is a disciple. How does one come to possess or rather BE possessed of such Love for God? Father, I desire to be possessed by great Love for You. I choose to love You with all my heart, with all my soul, and with all my mind (Matthew 22:37). By Jesus. Whosoever does not persevere and carry his own cross and come after (follow) Me cannot be My disciple. The Cross is the situation or relationship that you cannot control, cannot escape and do not want. It cuts across your will, confronts your strength and attacks your dream. The Cross ‘crosses you up.’ It cuts across your path and ever makes a new fork in your road. The Cross is ever a choice, a pivot of your history. The Cross is the pivot of human history, the marker of eras, the end of human misery. It is the great mystery of God and only those who carry their own Cross – their personal dying for Jesus’ sake – know its secrets. The Cross is the great divide between believer and disciple. The disciple is proven by the Cross. The believer is exposed by the unwillingness to die. Father, reveal my Cross to me today. I commit to this Cross. For Jesus. So then, none of you can be My disciple who does not give up all his own possessions. Therefore, salt is good; but if even salt has become tasteless, with what will it be seasoned? Oh, the Lord is so strange in His teachings! His subject goes from war, to possessions and ownership, to salt. And there is a “therefore”…meaning it is a connecting statement. Only the Lord can reveal His own sayings. Salt is a substance of the earth. Salt brings out the flavor of whatever it touches. It does not seek its own flavor. Salt causes the flavor to snap out of those foods it touches. Salt is a needed element for all foods. Everything edible needs salt. Life is tasteless and dull, difficult and painful. ALL of it, full of monotonous duties and cruel situations made so by the need for God on the earth. Salt stands for the divine life, the presence of Christ that transforms ordinary living into a delightful – if taxing – adventure. The disciple is one who is willing to lose all, live by the Cross, build the church, fight the fight (Luke 14:26-33) and own nothing… THEREFORE that one will be salt to a weak and bland world. That’s why the word ‘therefore’ is there. The true disciple is therefore…salt. Father, I WILL lose all, embrace the Cross when it comes, build Your church, fight the fight, and own nothing. I want to be salt. Through Jesus. Day 35: Do You Love Me? Day 91: Whose Love Do You Love?